Finke Gorge National Park covers an area of 46,000 hectares which inlcudes Palm Valley. Palm Valley has a diverse range of plant species, many of which are rare and unique to the area, including the Red Cabbage Palm. 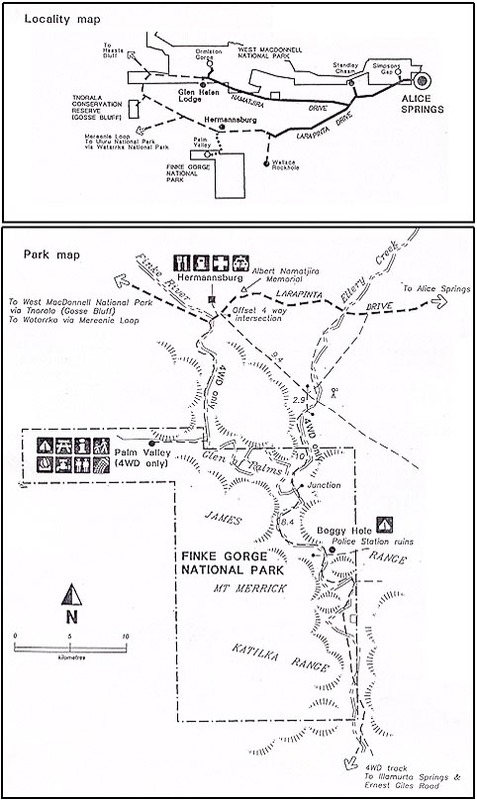 The Park lies 138 km (about 2 hrs) west of Alice Springs. You need to turn south off Larapinta Drive just west of Hermannsburg, and the turnoff can be a bit difficult to spot. In fact you are likely to miss it and will need to backtrack once you hit Hermansburg. 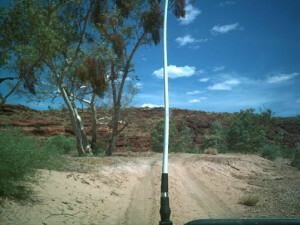 Access along the the sandy bed of the Finke River is limited to 4WD vehicles only, and heavy rains cause this section of the road to be impassable. Watch the weather! 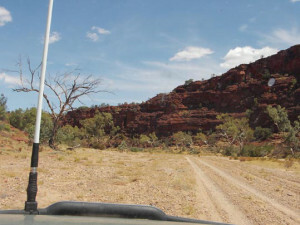 The 4WD track to Boggy Hole within the Finke Gorge National Park and on through to the Ernest Giles Road and Watarrka is suitable for experienced drivers only. 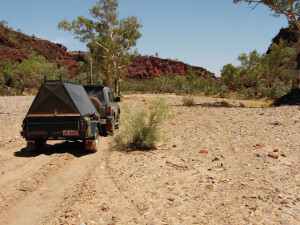 Camping is permitted in the Finke River on this route with the best spot (but with no facilities) at Boggy Hole. This is a large waterhole, and often has quite a bit of water in it. It is strange to see a variety of water birds, amidst the seeming desert. The snakelike flexing in the fibreglass radio aerial you see above is no illusion! Keeping up enough speed to cross deep sand sections takes some doing when towing a trailer. Traffic along the track is reasonably infrequent, which adds to the beauty but it is wise to travel with another vehicle (especially in Summer). You should seek the latest advice from rangers at Finke Gorge National Park or Watarrka National Park before attempting this spectacular, but adventurous, track. A must stay along the river bed is Boggy Hole (click on the link to see some more pictures of this wonderful oasis) as it often has water in it and is and absolute delight to dive in and cool off after a hot day. As mentioned elsewhere, National Parks and Wildlife are not overly happy about the the use of trailers on this track. Really it is a safety issue, and those considering towing a trailer must understand that it is a challenging task. Do not tow a trailer unless you have extensive 4WD experience or you are part of group, that can offer assistance if you run into problems. 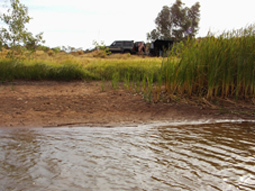 An air compressor is a must… you will need to deflate tyres to navigate this soft sandy river bed. The Northern Territory, Parks and Wildlife page on Finke Gorge National Park is certainly worth checking out for more background information.